Do you know who this is? Cute little lizard who finds himself in an unknown desert and has to save a whole town …RANGO!!! Do you know how Rango walks? 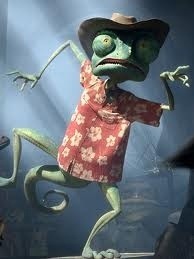 Kind of like a bow legged cowboy… I WALK LIKE RANGO NOW!!! I feel like I’m constantly on my way to a good ole gun slingin’. I feel like pregnant Heidi Klum never walked this way!! 😦 how did she do it! ?